Comparative religions class in Modesto, Calif.
Caitlin Gillooly had a sense of sadness as she watched Unwelcome: Muslims Next Door in her sixth-grade classroom in a suburban Boston middle school. The 2010 documentary by CNN about local opposition to a new mosque reported how residents in Murfreesboro, Tenn., burned equipment on the mosque construction site and fired shots at Muslim leaders. Caitlin’s face mirrored the shock and confusion on the faces of her classmates. She listened as some residents contended that the mosque would provide a foothold for radical Muslims, and as a lawyer — after the mosque’s opponents filed suit to shut down construction — claimed that Muslims did not believe in God and reminded the courtroom of the Muslims who strapped on bombs and blew up the World Trade Center towers. Caitlin, then an 11-year-old altar girl at her family’s Episcopal church, was sad because she realized she could have been one of those people spewing hate at Muslims if she had not learned about other religions in her social studies class at Wellesley Middle School in Wellesley, Massachusetts. But along with her sadness came gratitude. The sixth-grader was grateful that her school went farther than most to teach about world religions. 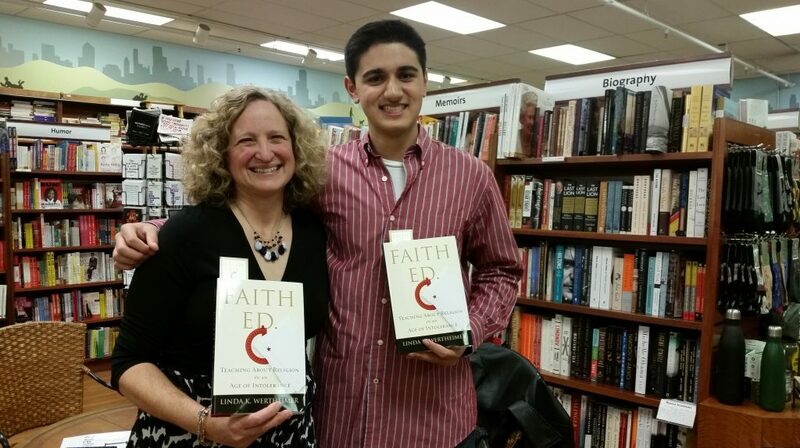 Author Linda Wertheimer with Zain Tirmizi at a reading of her book. Wellesley educators, realizing the increasing religious diversity in America and a fast-changing world, redesigned the social studies curriculum in 2000 to put a greater emphasis on different faith traditions. 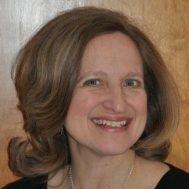 The school’s faculty saw sixth-grade as an ideal time to focus on religion, because 11- and 12-year-olds often are preparing for rites of passages in their own faiths, such as a bar or bat mitzvah in Judaism. The course, educators hoped, would not only reduce ignorance but also help to create more respect for many religions among the predominantly white and Christian population in the affluent suburb. Instead of getting instruction about religion in bits and pieces, the students focus on four religions (Judaism, Christianity, Islam and Hinduism) from January to June. 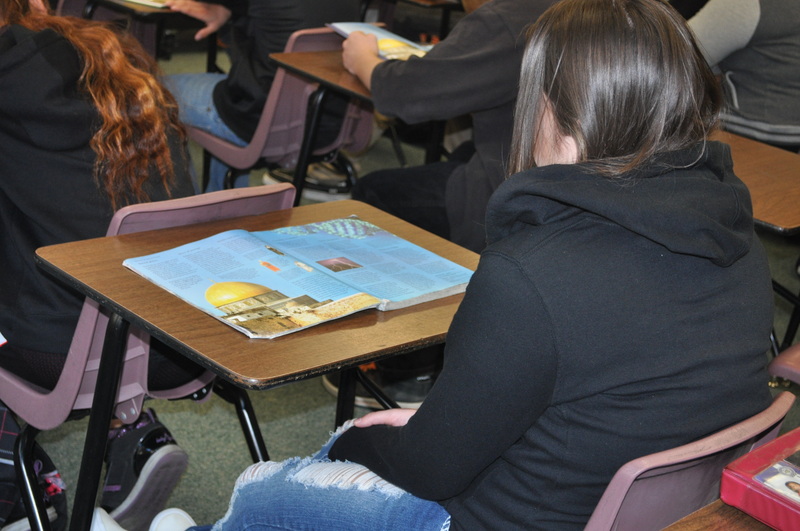 Nationally, most middle and high schools teach world religions as part of social studies, given that most states began requiring study of the subject as part of history and geography in the 1990s and early 2000s. 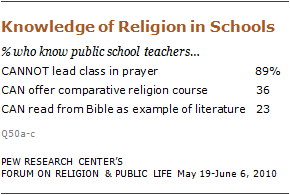 Typically, schools, at a minimum, include some study of Judaism, Christianity and Islam as part of history classes. Often, they add Hinduism, Buddhism and sometimes, Sikhism. Schools at least touch on the major figures, founders, holidays and core beliefs and practices of different faiths. Some work hard to make links, showing similarities and differences. Some try field trips to houses of worship. Others avoid them. 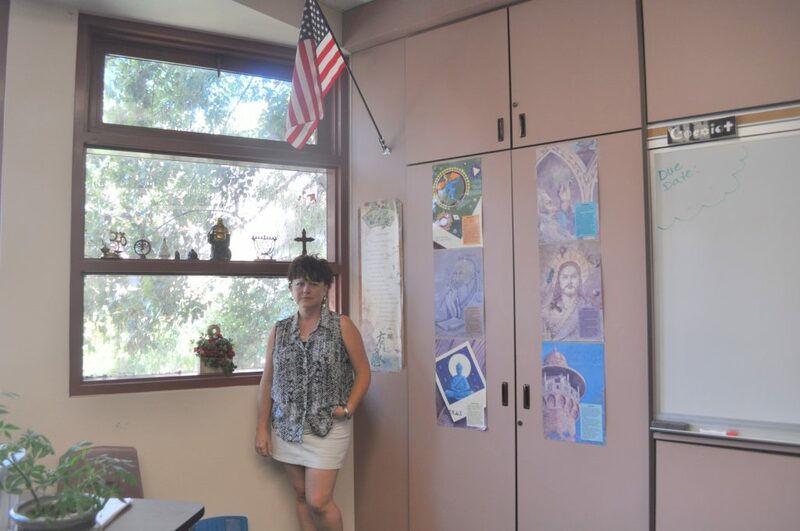 Modesto Teacher Sherrie McIntyre with some religious objects she keeps in her classroom. Similar to after 9/11, backlash against Muslims followed on the heels of the Paris attacks, such as a Muslim cab driver in the Pittsburgh area who was shot in the back on Thanksgiving by a passenger who complained about ISIS killing people. The most common backlash, however, is often the least reported — the kind of harassment Muslim youths experience after bad news breaks with the word “Muslim” or “Islamic” as part of the story. World religions teachers’ work can provide hope at a time when many American Muslims worry about how their children will fare in an increasing climate of hate and intolerance toward Muslims. When the Wellesley students watched the film, some of the 11- and 12-year-olds occasionally glanced at Zain Tirmizi to gauge his reaction. One of two Muslims in the class, Zain was the one willing to talk about his faith when it was the subject of a lesson. He also was willing to speak with me about his experiences as a Muslim youth as I wrote first a magazine piece, then a book about schools’ efforts to teach about world religions. “You’re a Muslim. I’m going to check you for bombs,” a peer said to Zain when he was in fourth grade in a Wellesley elementary school. Zain’s father coached his son to educate the other boy about Islam, and that it taught peace, not violence. 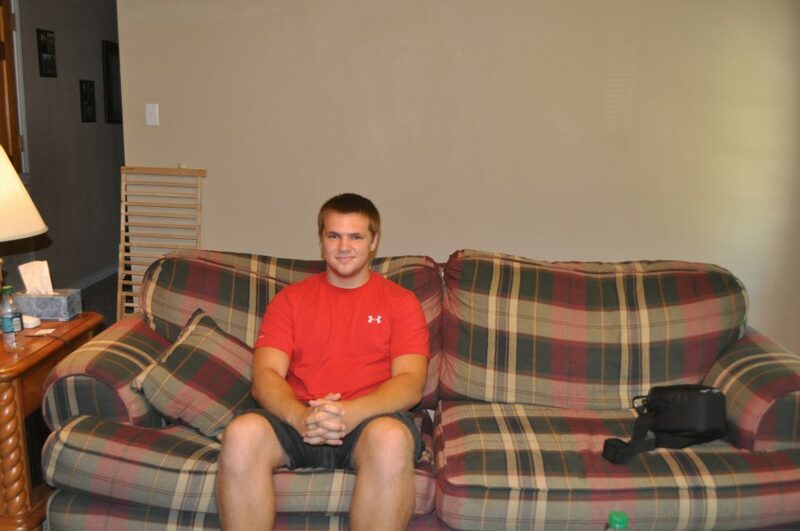 The boys eventually became friends. Zain’s parents, Hadia and Ali Tirmizi, almost sent their eldest son to private school, where they felt that there might be more diversity than the predominantly white and Christian middle school in Wellesley. Zain, they knew, stood out as one of just a few Muslims. They sent him to the middle school, though, and eventually felt that the world religions course made the atmosphere better for their son. They also visited his class and spoke about how they, as a family, practiced Islam. Their visit made a huge difference to Caitlin, who liked hearing about the rites of passage. She also had never met many Muslim people before other than Zain. She, like many of Zain’s peers, did not know about the questions he sometimes posed to his parents, like why some people hated Muslims so and why a pastor in Florida would burn the Quran. They were questions his parents struggled to answer as they worked to instill pride of their faith in Zain and his little brother. In the aftermath of the Paris attacks, Hadia Tirmizi wrote a Facebook post that quoted a trending Twitter hashtag #NotInMyName. She also posted photos of herself and her husband, both physicians, on a previous vacation to Paris. She and her husband saw education as a part of the solution for their children and their peers. If schools could better educate the next generation, then perhaps Muslim children would suffer less harassment than their parents, perhaps youths would better grasp than many adults, than many Republican presidential candidates, that you can’t castigate an entire people for the actions of extremists. Teachers I interviewed did not avoid a fear of some parents: That religion can have its dark sides. McIntyre delivered the same message in 2001 after 9/11 and in 2013 after the Boston Marathon bombings when she taught the one-week unit on Islam. She told her students that terrorists are awful people so it shouldn’t be a surprise that they drag their religion down with them. “It’s people who screw things up, not the religion,” she said. 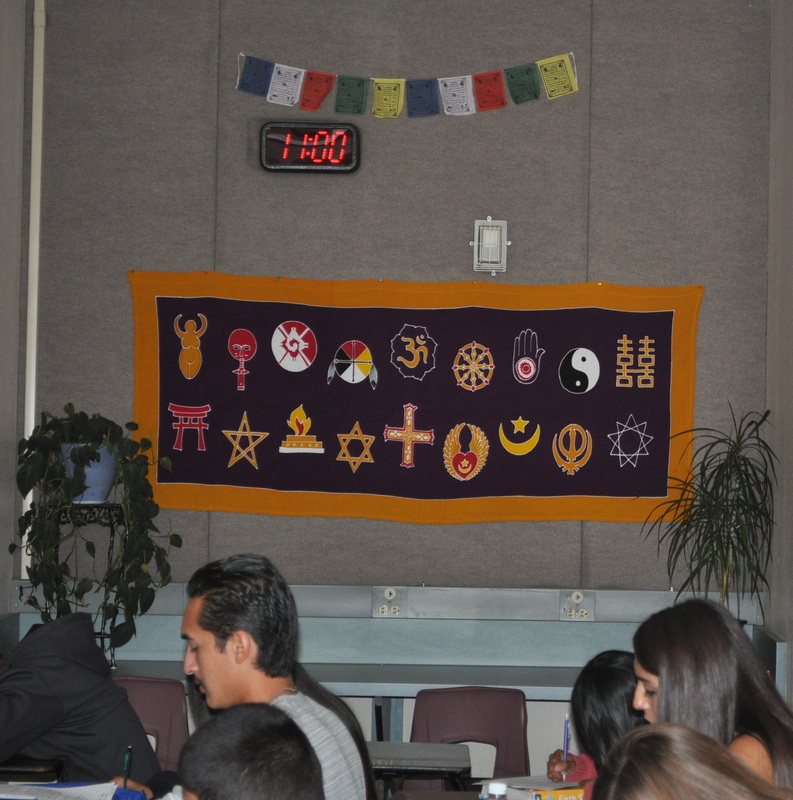 Modesto is often held up as a model for teaching about world religions because it’s the only school system that requires the course as a graduation requirement. It also has never had a controversy due to the instruction and strict rules for the course. Teachers are not permitted to take students on field trips to houses of worship, nor do they bring in guest speakers. They also avoid debate and use material mostly developed at the school-district level. Plus, the course is only taught for nine weeks. In Wellesley, the students take field trips annually to a mosque and a Jewish house of worship. The school also brings in guest speakers on Hinduism and Christianity. The teachers foster heavy discussion on topics that many adults would avoid. They take risks because they want to engage the students. In the spring of 2010, a field trip to a mosque in the Roxbury neighborhood of Boston went awry and caused an outcry when a handful of boys joined the line of prayer at a worshipper’s invitation. A parent chaperone was secretly filming the field trip for the Boston-based Americans for Peace and Tolerance, which had opposed that particular mosque for years. The group contended that the mosque had been backed by funders with terrorist ties, an allegation mosque officials steadfastly refuted. In September 2010, several months after the field trip, the group released a video lambasting the school system with the headline: “Wellesley, Mass. Public School Students Learn to Pray to Allah.” For several months, the school system was under scrutiny, mostly by outside groups. Parents, in fact, overwhelmingly supported the school’s world religions class. School system officials, though, apologized for an error: The students should have observed rather than participate in active worship. After the controversy, the school system continued the field trips, but went to a different mosque in Wayland, a suburban Boston mosque that was not considered controversial. The uproar, which included some of the same venom aimed at Muslims in Murfreesboro, Tenn., faded. Educators became more careful in some ways. They avoided anything that resembled ritual. But teachers like Rabinowitz pushed the envelope in other ways, determined to help students become better critical thinkers. From the beginning of his instruction on Islam, Rabinowitz defined the word “stereotype” and had students examine common stereotypes of Muslims, including the mistaken notion that they all lived in the Middle East or that they were all terrorists. Rabinowitz used facts to debunk each one. After his students watched Unwelcome: Muslims Next Door, he assigned specific roles to his students in an attempt to get them to take different sides. Most students, though, resisted taking the side of the mosque opponents. Harrison Chisholm had been assigned to talk as a Jew who had been put down by Muslims. Harrison, who really is Jewish, said he would still support the Muslims’ right to build the mosque. “I think the mosque should be built because we’re educated about Islam, and we know all Muslims are not terrorists,” he says. Around him, other students called the mosque opponents selfish given the Tennessee town had so many churches, and the Muslims needed a bigger place to worship. Sharon Peters a retired Lumberton High School geography teacher showing the burka she let students try on in class. Wellesley is known for its liberal-mindedness, and the teachers mirror the open-mindedness many of the students hear from their parents. When I traveled to Lumberton, Texas, where a furor broke in 2013 over students trying on Muslim clothing in a world geography class, I still found open-minded teachers there intent on teaching similar lessons. The furor had made national news. A Facebook photo of five students in clothing commonly worn in Muslim-majority countries had gone viral. One girl wore a blue burka, the clothing item that drew the most outrage. “The lesson that was offered focused on exposing students to world cultures, religions, customs, and belief systems,” the Lumberton school system explained in a statement. “A description on the whiteboard behind the students show the splits in religions: Islam (Sunni and Shia), Judaism (Reform, Conservatives, and Orthodox), and Christianity (Catholic, Orthodox, and Protestant). Clothing expresses the individual culture. The lesson is not teaching a specific religion, and the students volunteered to wear the clothing.” Still, uproar over the photo intensified. Christy Skinner, an English teacher at Lumberton High School, spoke in support of the embattled geography teacher at a school board meeting in 2013. At that meeting, residents, many from neighboring towns, lashed out at the school system for trying to brainwash students to support Islam when it should be working to put more Christianity back in the schools. Skinner, whose twin daughters were attending the high school at the time, implored parents to keep an open mind. Sharon Peters, the world geography teacher, retired at the end of the school year. She had been on the fence about ending her teaching career, but the controversy over her lessons on Islam convinced her it was time to move on. Her successor, Brad McBride, already had been teaching about Islam in world history classes. In his geography and world history courses, he set the same ground rules, prohibiting name-calling or degradation of other faiths. When he taught about Islam, he heard a common question from students: “Why do they all hate us over there?” McBride, sounding much like the teachers of Modesto and Wellesley, told his students they were trying to paint all Muslims with the same brush because of what they heard on the news about terrorists. But not all Muslims acted that way, he told them. He added that he was sure his students would be fine if they were friends with the few Muslims who attended Lumberton High. Student has an open textbook during the first week of her world religions course in Modesto, Calif. While Zain was fine being open about his faith at Wellesley Middle School, the Muslim students at Lumberton High were not. When I visited Lumberton in 2013, teachers knew of only one Muslim, a 17-year-old senior whose brother had graduated a few years before. The girl agreed to speak with me, provided her name was not used. She feared that people would take it out on her parents if they knew she was Muslim. Her mother was white and had converted to Islam after marrying her father, who originally came from Jordan. The girl did not take Peters’ course. If she had, she said, she’s not sure if she would have appreciated the exercise because photos of students in the burka, hijab and other clothing made it seem as if the teens were laughing and making fun of what they were wearing. But she liked that Peters was at least trying to teach fair lessons about Muslims. Her particular geography teacher, she recalled, had made prejudicial comments about Muslims and implied that all Muslims were terrorists. She lived in a town, too, where a few parents had yanked their teens from world geography courses because they did not want their children learning about Islam, period. 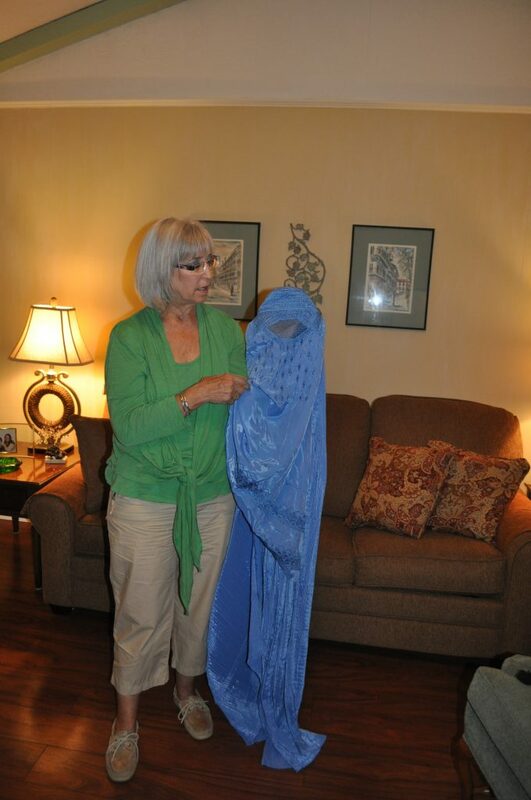 In Lumberton, I interviewed the 15-year-old girl who was wearing the blue burka in the photo and her mother. Though the mother had spoken openly at a public school board meeting, she asked me to keep her and her daughter’s names private to protect her daughter from further teasing. She let her daughter quit Lumberton High in March 2013, about a month after the photo went public. She had been picked on in school because of it. When I interviewed the daughter, she was being home-schooled using a curriculum developed by former presidential candidate Ron Paul, who incorporated study of the Bible in some of the courses. The girl recalled how Peters had asked her if she would be willing to try on the burka, which was child-sized and would fit the petite teen. The girl agreed to wear it and did not worry about the dress-up exercise until later, when her parents became upset and showed her a video of a Muslim woman who was whipped for wearing pants. The teen said she began to feel duped into putting on the burka without knowing its history and reputation as a sign of oppression. Her mother, disturbed by the burka, was surprised that the school was teaching about religions at all and that Islam in particular was covered. Her daughter didn’t like that Peters had only provided a half page of material about Christianity, less than for the other religions. She was particularly nervous about learning about Islam in school. Because of 9/11, she was uncomfortable hearing about Islam, so much so that the teen did not think it should even be introduced and accepted in the schools. Since Muslims wouldn’t learn about Christianity in their countries, she mused, why should Americans have to learn about Islam here? “I think it’s making us very vulnerable. I feel uncomfortable with Muslims in the White House,” the teen said. “The president could be,” she said. I noted that it had been well established that President Barack Obama was Christian despite rumors to the contrary. Even so, the teen replied, the lesson about Islam gave her an uneasy feeling. She would always be cautious in regard to Islam and Muslims, she said. The religion, in her view, was just different. “Would you ever want to see the inside of a mosque?” I asked. The 15-year-old was largely the exception to youths I interviewed around the country, including in Texas, Kansas, Florida, Ohio, California and Massachusetts. Most not only were open to learning about Islam but believed teachers were providing a much-needed education. Zachary Kellas had taken the world geography class in ninth grade in Lumberton and had tried on garb traditionally worn by Saudi Arabian males. He was so upset about his class being unfairly depicted in news reports that he spoke at a school board meeting as well. Zachary, who is Catholic, remembered Peters’ lessons about how Islam had similarities with Christianity and in fact stemmed from Judaism and Christianity. He refused to characterize all Muslims the same way, and yes, he knew about the 9/11 attacks. He thought learning about Islam could help him even in southeast Texas, given that neighboring Beaumont had a few mosques. At the school board meeting, he sounded like the audience’s teacher instead of the innocent child so many were trying to protect. He described how studying different religions, including Islam and Buddhism, related to studying other countries. It was common sense. How could students learn about certain countries without hearing about the religious influences? In Wellesley, Modesto and other towns and cities, students recounted to me how their world religion courses made a difference in the treatment of not just Muslims, but also Jews, Sikhs and Hindus. Students sometimes would forget the facts they learned, even that Ramadan was a holy month for Muslims, but they kept the abstract message: That they should not stereotype based on faith, that they should also never hesitate to stand up for the rights of the smallest minorities. My interviews showed that result, as did research by political scientist Emile Lester, who surveyed hundreds of Modesto students. Zain Tirmizi is now 16 and at Wellesley High School. He, along with his parents, remain convinced that the course made a difference in how students viewed other religions, even if on occasion Zain is teased because he is Muslim. I first met him in sixth grade and interviewed him again the summer after his eighth-grade year ended, in 2013, a few months after the Boston Marathon bombings. Zain recounted how not long after the bombings, a substitute teacher was in his eighth-grade social studies class. She began talking about how certain Muslims were coming into the country, taking the nation’s resources and then doing things like the marathon bombing. Several of Zain’s classmates looked over at him, trying to see if he was upset. Zain was about to speak in protest when the teacher retracted her statement and said, “I don’t mean all Muslims.” The next day, the class brought up the incident with the regular teacher. Zain believes that many of his peers might not have thought anything was wrong with the substitute’s comments if it weren’t for the sixth-grade world religions course. He thinks the course made them more willing to speak up when a religion was denigrated. Caitlin, Zain’s sixth-grade classmate, finished the school year believing that most people should take religious studies classes. She thought such courses could eliminate the bigotry too many Americans expressed in controversies, including the one in Tennessee and the one in her own town over the mosque field trip. It made her mad, she said, to listen to a lawyer at the Tennessee hearing imply that Islam wasn’t a religion. Before taking the course, she said, she had known a lot about Christianity and a little about Judaism but nothing about Islam or Hinduism. 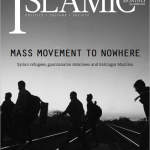 This article appears in the Winter 2015/2016 print issue of The Islamic Monthly. The magazine can now be purchased with print on demand! Purchase a single issue here.